Dragging garden hoses around the yard and setting up sprinklers is one summertime chore no needs to sweat over. Keep the lawn, flowers, trees and shrubs looking their best by installing a dedicated sprinkler system in your yard. Do you need a building permit to install a permanent sprinkler system? Do I know where the underground utility lines are located in my yard? If not, what’s the number for your utility company? Are any local watering restrictions or ordinances in effect? Do your state/ local regulations require a licensed professional to help with part of the installation? Some require professional electricians and plumbers to handle the technical stuff. Once your homework is done, focus on the details of your sprinkler project. First, set an overall budget that includes the use of professional service people to connect the timer box or tap into the main water line of the house. Also, if you are adding a system to an existing lawn, then factor in what it will cost to fix the damage that trenching may leave across the grass, such as additional sod, grass seed, fertilizer, etc. Many sprinkler manufacturers can create a customized design for your landscape. 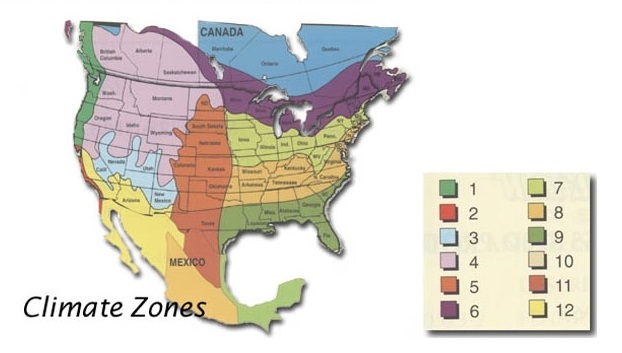 They offer templates for you to map all of the features in your yard like shrubs and flower beds, areas of sun and shade, and hardscapes like retaining walls. From this, they will help you design a sprinkler plan with the correct number of zones and suggest the materials needed to install your system. This service may cost a nominal fee but it is worth it to have the details worked out so you don’t have to. Mark the location of all the trenches and sprinklers with stakes or plastic flags. With a gas powered trenching machine, dig trenches 4-12 inches deep according to your plan. The manufacturer will have taken into consideration the area you live and how deep the water lines need to be to keep them from freezing. Turn off water to house at meter. Cut into the main water line. This may be where you want to hire a professional plumber to make sure that the work is done properly and your water pressure is maintained. They can also install a backflow prevention device. Dig a trench from the main water line to the valve box location. At the end dig a hold about 18 inches deep and 2-3 feet long. Line hole with 2 inches of gravel and set the valve box into it. The box lid should be flush with the grass. Next glue together the manifold and attach the zone valves. Set manifold in box. Dig a shallow trench from valve box to the location you want for the timer. Lay the 24 volt underground wire in the trench and connect it to the wires leading from each valve. Place pipes in trenches leading from the valve box. Whenever a pipe branches off you will need to splice a tee fitting to the main pipe and attach a short length of flexible pipe. Using 90 degree PVC elbow joints join pipes in trenches to the valve box. Turn on the water and flush the pipes to eliminate dirt in line and avoid clogs. Turn water back off. Install pop up sprinkler heads to each of the flexible pipes. After mounting the timer box where you want it, attach the 24 volt wires from the zone valves to the timer. You may want to hire an electrician to run power to the timer box. Set timer and run tests on the system to see where sprinkler heads need to be adjusted. Check lines to make sure there are no leaks that can cost you money down the road. Fill in trenches with soil and repair the lawn with sod or seed. You may want to save money doing the job yourself, but that’s no reason to skimp on the quality of the parts you use. Sprinkler heads take a beating from day to day use and getting mowed over. Putting money into quality sprinkler heads will cut down on you having to go back and forth to the hardware store. Also, research the features you want on your timer. You may want one that allows you to test the system without having to disrupt your programmed schedule. You may also want features like rain sensors or frost sensors so the system doesn’t run during those times. Homework, folks, will help you avoid any headaches and get you the sprinklers you want. Now sit back and enjoy the fruits of your labor and forget all about those stupid garden hoses – except, of course, if you like watering your prize roses by hand. Then by all means, find a great water hose at Runyon! Our expert staff is always on hand to help you with your yard and garden projects. From landscaping tools to a trencher, if you have any questions about what to choose, pricing or how-tos, don’t hesitate to contact us. Stop by our store — we’re open seven days a week. With the crazy weather we’ve been having, it’s hard to know when it is safe to plant trees and shrubs. A good rule of thumb to follow: if the ground is 60 degrees or warmer, then it’s safe to plant. Get busy deciding where and what you want to plant. We’ve put together some helpful tips, once you have made your final decisions. Check the site – You need to make sure the tree or shrub will have room to grow over the years. Take the time to scout out the area now so you don’t have to move or lose a bigger plant later, if it grows into overhead power lines. Inspect the soil – Determine the condition of the soil and if there is adequate drainage. While you’re doing that, check to see if the plant have enough light in this spot and will it be protected from the wind. Call before you dig – It is better to be safe than sorry, so call your local utility company and find out where underground lines may be hidden. Look at the root ball – That mass of roots circling the pot usually means the plant is pot bound. “Teasing” the roots or cutting the root ball will help them break free. It will keep the roots from “girdling” or strangling the tree or shrub later. Soak the root ball – A good soak before putting the plant in the ground will help hydrate the roots and wash off any contaminants that might be hiding in the potting soil. Set it free – Cut away any plastic or burlap holding the root ball together. Be sure to remove any wires or staples as well. Many of these materials will not disintegrate over time so don’t take the chance of restricting your plant’s growth. 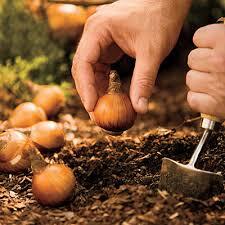 Think wide not deep – Dig your hole twice as wide as the diameter of the root ball. You need to keep the top of the root ball above the surrounding ground. Pack it down – Don’t leave loose dirt at the bottom of your hole. It will allow the tree/shrub to settle and can affect drainage around the tree/shrub. Put it in the ground – Position the tree in the hole and then check to see if it is level from several different views. Fill the hole with native soil instead of amended soil to avoid shocking the plant. Mulch – Put a 2-4″ thick layer of mulch around the base of the tree but avoid putting the mulch right up to the tree base. This can allow disease and pests to attack the roots. Most gardeners do not realize that winter is actually a dry season for plants. Yes there is plenty of snow on the ground at the time but until it melts and the ground thaws the plants do not get the moisture they need. This is why if you decide to plant your trees or shrubs in the spring, you will need to make sure they get enough water to help them transition from the shock of planting. Give them a good soaking every couple of days but allow the top soil to dry out in between watering. It will help your plants become established and get them ready for the heat of summer. Don’t forget to give them extra water in the fall to prepare them for the “dry” winter. Our expert staff is always on hand to help you with your yard and garden projects. From landscaping tools to augers and more, if you have any questions about what to choose, pricing or how-to’s, don’t hesitate to contact us. Stop by our store — we’re open seven days a week. For more Spring gardening tips, check out our infographic, 11 Lawn & Garden Tips for Spring and our blog, 5 Ideas to Spruce Up Your Garden with New Plants. Looking at your yard this spring, you are overcome with a desire to change things up. Where to start? You don’t have the budget to rip everything out and start again so do you live with what you have? Don’t fret, we have just the solution. Plant some annuals. Set your artistic side free! Sure, annuals are one-season flowers and plants but they can give you the creative freedom to experiment with your landscape. Introducing a touch of color here or a spot of texture there may be just the thing to take your garden in a whole new direction. Annuals come in every color, height and texture. They are an easy way to change things up without having to totally recreate your garden. Hardy annuals – these plants will tolerate the first frost. Half hardy annuals – these plants can withstand a mild frost but not sustained low temperatures. Tender annuals – these flowers and plants will die off at the first sign of cooler weather. The most convenient way to get annuals is from your local garden center. Buying annuals at a garden center will allow you to get a jump on designing your yard. These plants are already established and flowering. You just have to put them in the ground. If you’re looking for a wide selection of native or exotic plants, check out plant sales at local public botanical gardens, arboretums and specialty plant growers. If you are determined to have hard-to-find annuals in your landscape then you can start them from seeds. Just be aware that this takes time and effort. We suggest you start slow and go with all approaches for your garden. Purchase annuals from your garden center, local specialty growers and more from seeds you grow yourself. 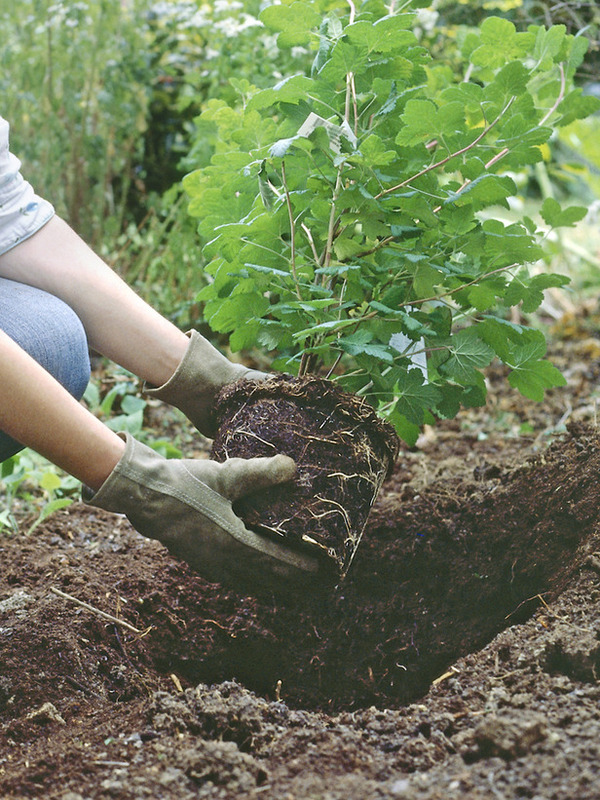 Start with soil that you have amended with compost or manure. Try to place the plants in the ground at the same depth they were growing in their starter pots. It will help avoid stressing the plant during transition to the garden. Spacing is a matter of preference. As your plants grow they will spread out and fill in but if you aren’t willing to wait for that to happen then go ahead and plant them closer together. Just know that you may have to remove some of them later in the season if overcrowded. Water – Soak the ground thoroughly. Soaker hoses and drip systems are the best. Allow the soil to dry out in between watering. Mulch – This will help retain moisture and keep weeds down. Weed – When annuals are first put out it is vital to keep the weeds to a minimum. They compete for the nutrients in the soil and sap the strength from the new plants. Cover – If a frost is forecast, protect new plants at night, removing the cover in the morning so plants can soak up the warm sunshine or rain. Stake – Tie up tall plants to prevent them from falling over. Insert the stakes in the ground next to the plant but far enough away to avoid damaging roots. Dead-Head – Remove blooms that have faded to help plants flower longer and more profusely. Annuals like Begonias that readily drop their spent flowers do not need to be dead-headed. Now is the time to fire up those creative juices and get ready to paint your landscape with a rainbow of colorful annuals. Don’t worry about making a mistake because this is one gardening experiment that can’t fail. If your design doesn’t work this summer then you can change it up next year. You can even make it an “annual” thing! (pun intended). Our expert staff is always on hand to help you with your yard and garden projects. From landscaping tools to tillers and more, if you have any questions about what to choose, pricing or how-to’s, don’t hesitate to contact us. Stop by our store — we’re open seven days a week. If you are looking out at your lonely pool, still garnishing the cover, devoid of any lawn furniture, it just makes you sad. Cheer up, though – temperatures are rising and the pool will soon be back in use. Sure, you have some spring cleaning to do but why not indulge your dreams of adding a poolside bar? Just think – no more wet feet running through your house in search of food and drinks! In your mind, is your poolside bar a stand-alone structure away from the water? Or do you want a bar with in-pool seating? Let its location, the style of your home and your budget dictate your choice for making it a reality. A stand-alone bar can be one that you build from scratch or assemble from a kit. You can even retro-fit a former garden shed by opening up one wall and building the bar there. There are so many options! Keep a few things in mind if you go with a stand-alone. You need to make sure the structure has a firm foundation or is anchored to the ground to avoid being toppled by strong winds. Extend the roof out over the bar and chairs to provide cover from the elements for your guests. You can line it with bamboo or palm leaves to give it a tropical feel. Consider adding a raised deck floor in front for bar stools. It will help anchor the structure and will allow guests to get their feet off of the hot pool deck. Add some hanging lanterns around the roof for a pop of color during the day and a romantic glow at night. Choose a section of the pool that is 30 inches deep to allow you to add the in-pool features. Add a raised shelf poolside and cover with tiles. Since you need to clean the pool anyway, drain the pool in order to install the bar stools. These are usually made of concrete pillars and the seats can be covered with tile that matches the new shelf. Give enough space between stools to allow guest to come up on their floats. Install a canopy of sailcloth or thatch out over the poolside shelf to allow swimmers to get out of the sun. You can use the same covering over the dry side of the bar as well. String lights beneath the canopy to give the bar an inviting feel at night. A poolside bar is a great way to create a gathering place for friends and family. Be sure to decorate your new structure in whatever theme strikes your fancy. 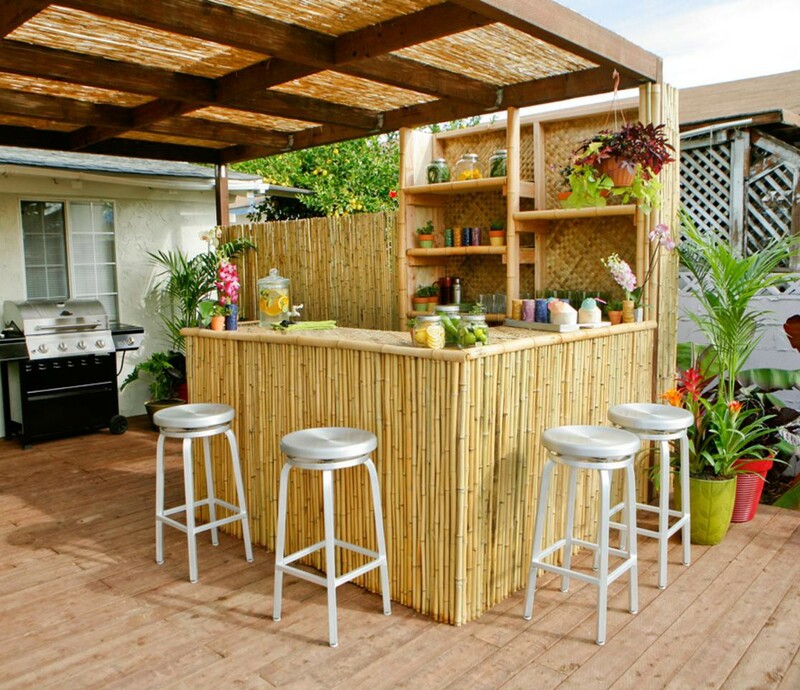 Make it a Tiki bar with palm leaves and bamboo or give it a nautical flare with anchors and fishing nets –whatever looks great against the backdrop of your home. Your bar can be as simple or complex as you want to make it. What matters the most is the hours of fun you will have outside with your loved ones. So light those Tiki torches and mix up some fruity drinks, your new bar is ready to open for the summer. Our expert staff is always on hand to help you with your yard and garden projects. If you’d like some advice about how to build your own fire pit, check out our blog post, How to Make a Concrete Fire Pit or Fire Bowl in 5 Easy Steps. Or better yet, you can purchase a completely all-inclusive glass fire pit from us! From concrete mixers to tile cutters and more, if you have any questions about what to choose, pricing or how-tos, don’t hesitate to contact us. Stop by our store — we’re open seven days a week. Now that spring is here it’s time to get outside. Time to put those DIY plans you’ve had rattling around in your head all winter into action. Let’s build that patio you’ve been dreaming of. First things first, make a few key decisions before starting to haul in the pavers. How will you use the patio? – For entertaining? To relax? How you plan to use it will determine the size and materials you will need. Where will you build the patio? – Look for an area that has good drainage, isn’t too close to trees, and is away from any buried utility lines. Call the power company before you start to dig and they can mark the location of the lines. How much do you have to spend on the project? – Figure out how much you have to spend and let that help you determine the size of the patio and the materials to be used. Do you need help? – Don’t forget that much of the materials needed are heavy and will have to be delivered. You may not be able to deposit the sand, gravel or stones close to your project site which means you may need to use a wheel barrow or front end loader to move the materials around. Concrete – This is probably the cheapest way to add a hard surface to your landscape but it can be problematic. If you choose to dye it with a coloring agent then you will need to be prepared to reapply the coating every couple of years in order to keep the color. Natural Stone – Flagstone, slate, bluestone and limestone cost more. The thicknesses vary so you have to carefully install each stone in order to keep the patio level. Brick – Offers Old World charm but needs maintenance. It is very porous and cold weather can cause it to crack leaving space for weeds or moss to grow through. Pavers – Home improvement stores carry a wide variety of shapes, sizes and colors. They are all uniform in thickness so they are easier to install than natural stone and they are fairly inexpensive. Your materials have been delivered and you are ready to begin. All patios need to be built on a level surface no matter what materials you use. Cracks, uneven surfaces and water pooling can all be traced back to not having a proper, level foundation. Let’s get started. Mark the site – Whether you use the old string and stake method or the new aerosol paint technique, outline the area where you plan to build. Dig, man, dig – Excavate down at least 8 inches for the sub-base of your patio. Whether you are going to pour concrete or lay pavers, the process is the same. No sub-standard sub-base for you! – Clear the area of all roots, rocks and debris. Stamp down the dirt with a hand or power-driven stamper. Check to see if the ground is level. If it is, add a layer of gravel and pack it down. Once again, check to see if it is level. Power to the pavers – Time to add the paving stones. Once you have laid them out in the design you want, stamp them down, and check to see if they are level. Adjust where needed. Sand in your pavers? – Spread sand into the joints between the stones. Don’t scrimp on the sand. Work it in between the pavers to help lock them in place. Wash down – Spray the remaining loose sand into the joints and now you are ready to clean up the patio and decorate. Now, you are the proud owner of an outdoor room. “What will I do next?” you may be saying to yourself as you roll that shiny new grill across the new patio surface. Anything! The world is your oyster. Go forth and build more. Need more inspiration? Read our recent blog, Stir Up a Little DIY Inspiration with these 3 Project Ideas. Our expert staff is always on hand to help you with your yard and garden projects. From power driven stampers to front end loaders and more, if you have any questions about what to choose, pricing or how-tos, don’t hesitate to contact us. Stop by our store — we’re open seven days a week.